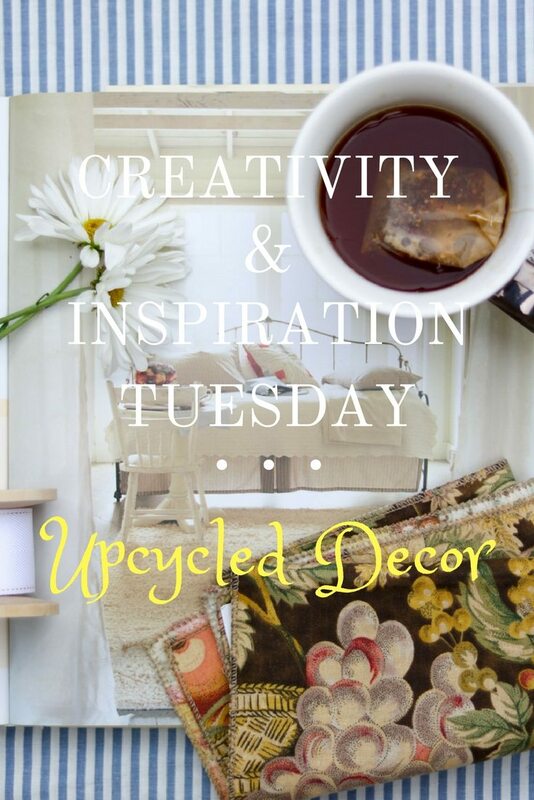 Creativity & Inspiration Tuesday – Upcycled Decor is a round up that will energize your creative juices with reuse and refurbish home decorating projects. Welcome to the first Creativity & Inspiration Tuesday round up! If you are new, this is a great place to get home improvement and decorating related ideas. This week is all about upcycled decor. In case you’re wondering what upcycling is it is defined according to the dictionary as “to reuse something and in such a way as to create a product of a higher quality or value than the original.” In other words, it is taking something used and giving it a whole new life. So check out these wonderful bloggers and their beautiful upcycled projects. I hope this post inspires and fuels you to start your own design. I absolutely loved this idea! Who knew an old door could look so good? The perfect summer DIY project. 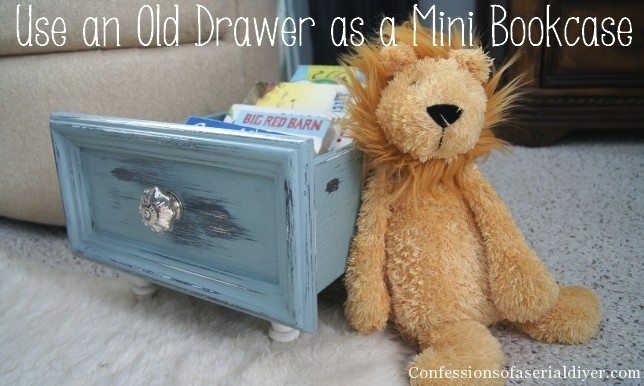 When Christy removed part of her son’s changing table, they were left with this extra drawer. Rather than throw it out, she turned it into a cute and useful tiny piece of furniture for his room! Jilly found this coffee table in Goodwill. 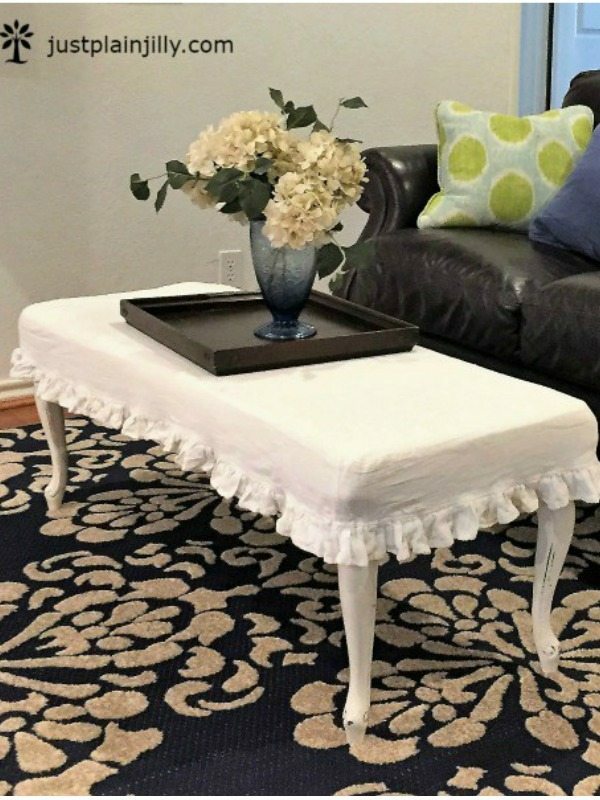 After some sanding, painting and a slipcover (washable of course), she had this beautiful ottoman to brighten up her living room! 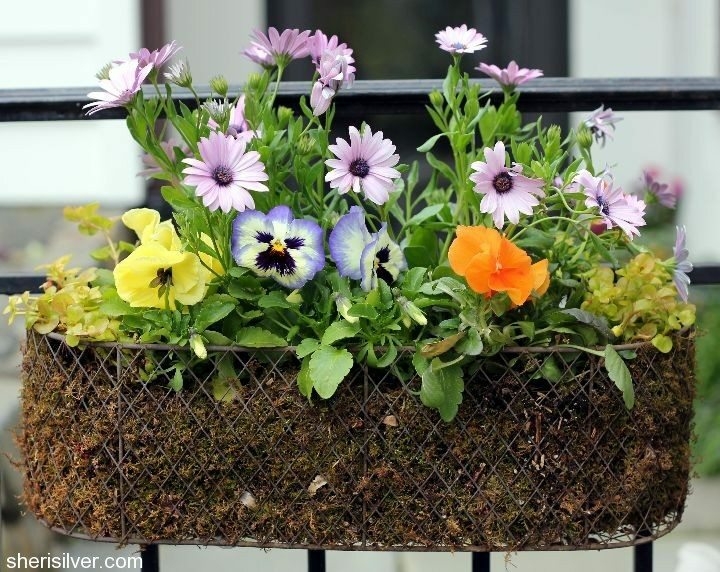 Sheri shows us in this post how you can make a planter out of literally anything, whether it’s an old bicycle basket (above), a watering can, or an old crate. It always amazes me when people take old things and give them new life. Recently, I was given a bench that was originally an old twin bed. I love that someone gave that old tired bed a whole new purpose and style. Did you know that there are millions of pieces of furniture dumped in our landfills each year? 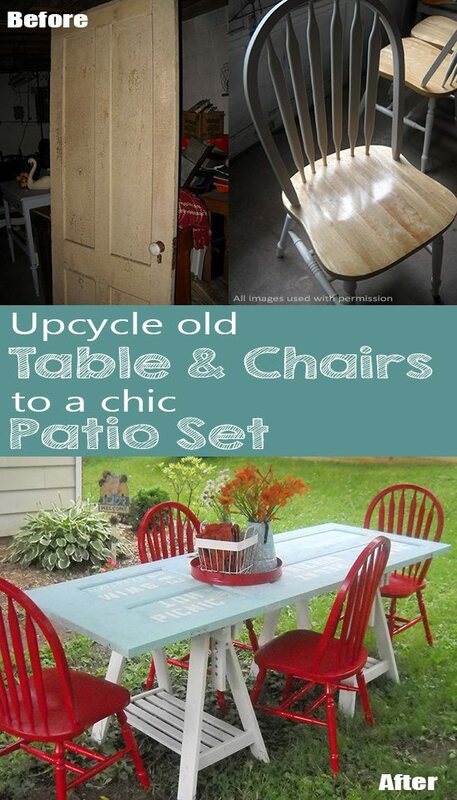 So, don’t be afraid to drive around on trash day and see what treasureS you can find to revitalize and upcycle. The earth will thank you for not sending one more piece to the dump. Thanks for stopping by to see all these wonderfully talented people. 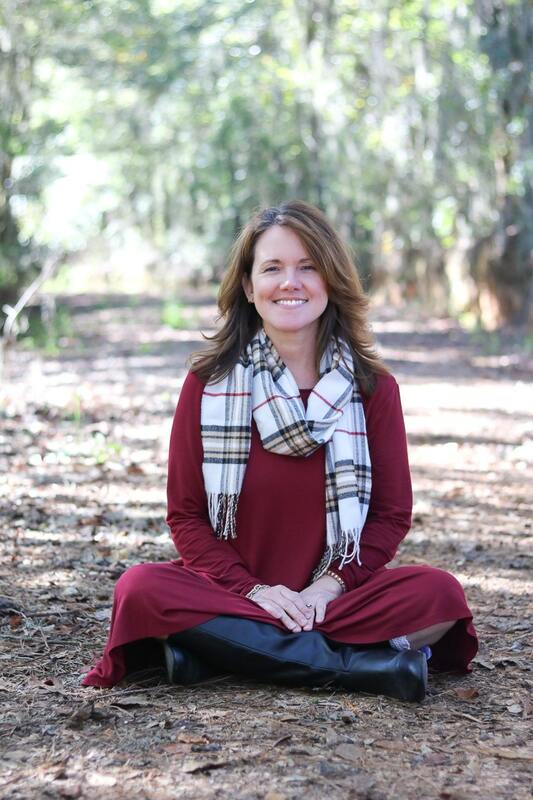 I hope you are inspired and can’t wait to find a diamond in the rough to be restyled. Do you have a re-purposed piece of furniture in your house? If so please share with us in the comments. We would all love to hear about it. If you enjoyed this post, please sign up for emails, so you don’t miss out on more fun decorating tips and gift guides HERE. These are great ideas. The door as a table . . . brilliant. And something that wouldn’t occur to me in a million years. But wow. I’m not great at visualization of things like that, unfortunately, though I envy people who are. I write fiction novels, but trying to take those creative juices and stew them into projects like these hasn’t happened for me. I love stuff like this, though. Thanks for a great post! What great ideas! Environmental face lift’s do give a new perspective, don’t they!?! Love this post. I am not a DIY-er at all, but I so love the creativity & talent you ladies have. Red chairs are my favorite in this post! Pinning!